Sony STR-DN850 review | What Hi-Fi? Take a quick glance at the Sony STR-DN850, and you could easily mistake it for its 2013 predecessor. From the outside, at least, it seems like very little has changed. Turn it on though, and you will see just how much difference a year can make. Sony has gone back-to-basics with the ‘850, and in all the right ways. The once button-heavy remote is a more simple affair – its back panel is now even cleaner and easier to understand than before. Its new user interface is one of the best we’ve come across on an AV receiver – well designed and easy to navigate thanks to its handy graphics. The interface makes Sony’s set-up and configuration process a breeze too. Attach the auto-calibration mic and a series of rather upbeat musical tones sound, which makes a welcome difference to the aggressive snaps, crackles and pops we’ve heard from rival manufacturers. It’s pretty quick to make its decisions, and they’re accurate too – we didn’t have to change any of its measurements, which are displayed nicely in a 3D graphic of your room and speaker set-up, helping you spot any obvious errors right away. Network setup is in the same Easy Setup menu as the speakers, and is completed without issue. The receiver picks up our wireless network quickly (although a wired LAN connection is available if you prefer), and we are just a password away from activation. Once connected, we are alerted to a firmware update, which will force your receiver into a hibernated state for approximately 30-40 minutes. We definitely recommend doing this immediately – your patience will be rewarded with the most stable and up-to-date experience for your amp. When it comes to features, the ‘850 is no slouch. A 7.1 channel amp, it offers a few handy additions to its predecessor – including aptX Bluetooth, NFC connectivity for one-touch pairing and an MHL (mobile high-definition link) connection for playing back photos and video from MHL-compatible mobile devices. Around the back, there are five HDMI inputs (one less than last year) with 4K upscaling and 3D/4K pass-through, plus one out. Exactly the same as last year, you will get four sets of inputs for analogue audio and three for composite video, as well as one coaxial and two optical inputs. There is a single USB input on the front for connecting portable devices and USB drives, which is compatible with files up to 24-bit/192kHz resolution. We put on a Blu-ray of Gravity, and skip to the scene where Kowalski (George Clooney) and Stone (Sandra Bullock) are approaching the International Space Station (ISS) after debris has destroyed their space shuttle. The ‘850 handles the dynamics of the foreboding soundtrack superbly here, building the sense of tension as they prepare to use the last of the thruster fuel to propel themselves towards the satellite. As soon as they do, the soundtrack really kicks in, big and powerful, as does the pulsing sub, replicating Stone’s racing heartbeat with punch and agility. The low-frequency weight on show here gives the whole scene solidity – a characteristic we found to be lacking in its predecessor. The good news is it keeps the agility we loved from last year too; the ‘850 reacts quickly to changes in tempo to keep a good grip on rhythm. We’ve no doubt there will be amps that sound more beefy but, at £400, the STR-DN850 offers a decent low-end kick for its price. Gravity is also a great test disc for sound placement, and the ‘850 impresses in that department too, demonstrating a wide soundfield and impressive handling of effects. Sound is spread cohesively across our 7.1 set-up, with dialogue between Kowalski, Stone, Houston and Explorer placed with immersive precision, while there is power in the devastation and panic caused when the debris shower hits. The detail on offer is notable too, with plenty of subtleties pulled out of the mix to bring depth and texture to equipment clunks, radio beeps and emotion-filled conversations. Switch up to Thor: The Dark World and during the attack on Asgard, there are plenty of opportunities for the ‘850 to show what it’s made of. Once the Kursed begin their assault on the Asgardian Castle, laser gunshots seemingly fly around the room from one speaker to another, while sword clashes have controlled zing and impact. Some of this performance has to be attributed to lessons Sony has learned from some of the ‘850s’ higher-specified predecessors. Its power amplifier circuit board has been modified to match that found on our 2013 Product of the Year, the STR-DN1040, using a glass epoxy resin material to improve sound quality and stability. Localised analogue voltage regulators have also been introduced – a design found in the high-end ES series – which Sony says will deliver an improvement in noise levels and bring more purity and definition to low-frequency sounds. From our time with the DN850, we can say it is a successful move. 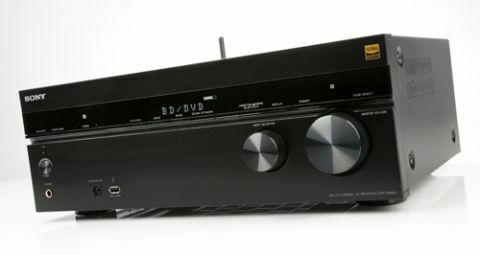 Stereo performance is admirable for an AV receiver, doing a good job where many fail – particularly at this price. Music has an impressive amount of rhythmic precision and detail, if it is a little bright. A bright recording can verge on the edge of uncomfortable at higher volumes, without careful pairing. Opt to use the Dolby Pro Logic IIx mode and this will help, spreading the sound around your speakers and adding a little more weight that balances out any top-heavy tendencies. It works well, although you will lose a hint of detail in the midrange as a result. Whatever you choose, we’d recommend using the amp’s Pure Direct mode when listening to music – we found it adds just a touch more clarity. As well as its AirPlay, DLNA and Bluetooth smarts, there are also a number of music streaming services built-in to the ‘850, including Sony’s own Music Unlimited service, Deezer and TuneIn Radio. These are all accessible via the music services heading in the ‘Music’ menu or via Sony’s free Songpal app, where you can also access Spotify. Music played over wi-fi or Bluetooth has a tendency to sound a little edgier and less detailed than CD recordings, but that’s the price for the convenience of music streaming. The Sony STR-DN850 is among the first 2014 AV receivers we’ve seen and we are suitably impressed. Well-featured, with a detailed and precise performance to match, it has taken on board the criticisms of last year’s model to make this the £400 amp to beat. We can’t wait to see what the rest of the range has to offer.